Welcome to Incredible India tour, You will be received and assisted by India Tours representative at International or Domestic Airport. 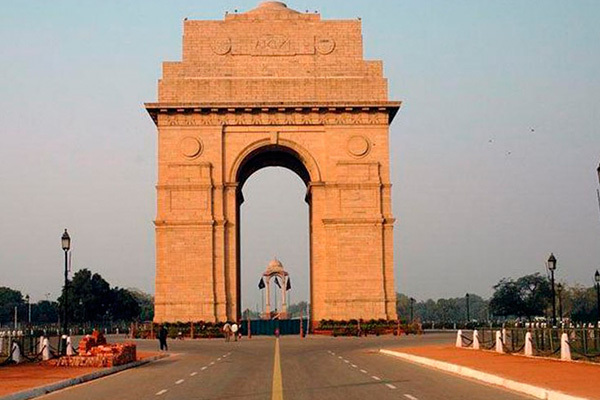 Take a full day city tour of Indias bustling capital city, Old and New Delhi present a stunning sights and sounds with the ancient city built by Emperor Shah Jahan the builder of the famous Taj Mahal, and the new garden city built in 1911 by the British. Drive through the old city pass the Red Fort and visit the Jama Masjid the biggest Mosque of its kind in India. Here take a walk through the winding streets of the old city Chandni Chowk Market to see the life of the people in this part of the world. Later visit Raj Ghat - the cremation sites of Mahatma Gandhi, After that visit Humayuns tomb the first Mughal construction in India from 1565 AD, India Gate (War Memorial Arch) built in the earlier half of the 20th century, Lakshminarayan Temple (Birla Temple) - modern hindu temple. Also drive past Rashtrapati Bhawan (President House), Parliament House, Government Secretariat Buildings & Connaught Place shopping centre. Overnight at Hotel in New Delhi. After breakfast continue towards Agra, Later arrive to Agra and see the Red Fort built by Akbar where Shahjahans own son Aurangzeb imprisoned Shahjahan. Later visit Taj Mahal - The 7th Wonder of the World is awaiting your arrival today. A must see with the sunset as the Taj Mahal is bathed in the golden rays of the setting sun. Built by Shah Jahan, the Taj is a white marble memorial that houses the tomb of his beautiful wife Mumtaz Mahal. This monument took 22 years to be completed and was designed, and planned by Persian architect Ustad Isa. Apart from its stunning design, balance and perfect symmetry, the Taj is also noted particularly for its elegant domes, intricately carved screens and some of the best inlay work ever seen anywhere in the world. Later you can go to local bazaar to do some shopping or relax at your hotel. Over Night at Hotel in Agra. In the morning after breakfast leave for Jaipur, On the way visit Fatehpur Sikri - the Phantom city, this abandoned city built by the Mughal emperor Akbar in the second half of the 16th century. Fatehpur Sikri was built by Akbar after his Hindu wife bore him the long awaited son who was born after the renowned sufi saint Salim Chisti blessed Jodhabai Akbars Hindu wife with a son. Also visit Jodhabais palace the biggest palace in Fatehpur Sikri even bigger than the emperors palace himself as this was the queen who bore him his heir to the throne. Later visit Abhaneri - Chand Baori, a stepwell one of its own kind, a must visit place. After that just entering before Jaipur visit the Galta Sun Temple and later arrive to Jaipur and visit Birla Temple which is a great piece of work in marble. Overnight at Hotel in Jaipur. Today take a full day city tour, In the morning take a short visit to the Hawa Mahal (Wind Palace) and later proceed to the Amber fort which displays a beautiful mix of Mughal and Rajput styles of architecture. ; take an elephant ride at the Amber fort. See the marvelous Sheesh mahal built in the 17th century in a fusion style of Hindu and Islamic art. Also see the hall of public audiences and Maharaja Man Singhs Palace who had twelve queens. Enrooted visit Water Palace which was a resting place for the kings in past. After that set off to see the Pink city visiting the City Palace of the Maharaja of Jaipur with a fabulous collection of robes and saris in cotton and silk with gold latticed work. The City Palace houses a collection of paintings also in the painting gallery and of course a collection of arms and ammunitions in the ammunition gallery. Later visit the observatory Jantar Mantar built in 1727 by Sawai Maharaja Jai Singh II who was a mathematician , an astronomer, an astrologer and a great musician of his era. He built five observatories throughout India in Jaipur, Ujjain, Varanasi, Mathura and Delhi but only the one at Jaipur is functional. After lunch you can do some shopping in the old city or you can enjoy a bollywood movie in Rajmandir cinema - Asia\'s Second Best Cinema - a highly recommended place. 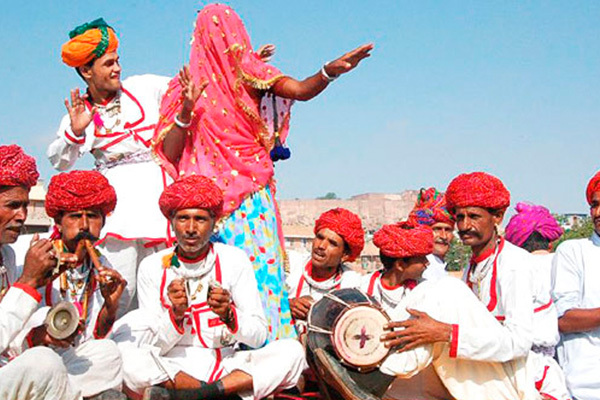 Later you can enjoy a Dinner in a typical Indian Restaurant with Folk Dances by Gypsy women. Overnight at Hotel in Jaipur. This day proceed towards Bikaner en route stop at Fatehpur Village to see the splendid havelis of the local merchants of Shekhawati. Reach Bikaner by lunch time. See the Junagarh Fort, a royal museum that encompasses history of Bikaner from its days of construction that dates back to the 16th century. Later visit the Karni Mata Rat Temple in Deshnoke, a unique experience. In the evening walk along the busy market area of Bikaner city centre. Overnight at hotel in Bikaner. Morning start your tour in the golden city with a visit to Gadisar Lake, Later take an exclusive visit of the Jain temples inside the Sonar Killa. The Jains are a community that respects life and are pure vegetarians by religion. Visit the citadels palace that houses a museum with a huge collection of robes and artifacts from the royal family of Jaisalmer. Visit the Patwon ki haveli with intricately designed latticed windows used by the ladies to view the external world. 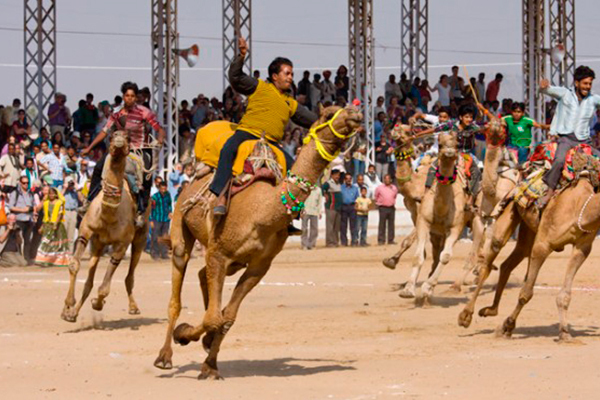 Later you go to Khuri village, Here we have loads of excitement in store for you. 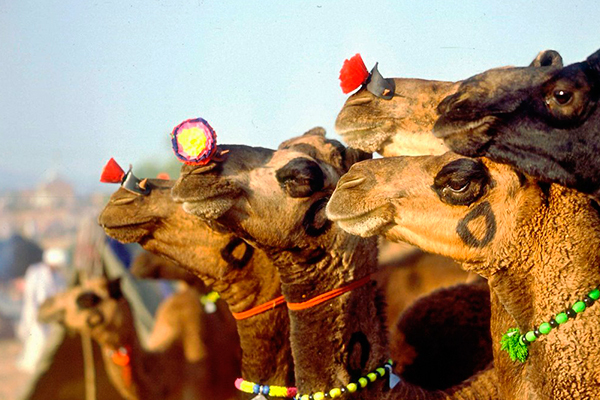 Upon arrival in the village you will be taken to the nearby sunset point on the dunes to see the sunset by camel carts. After the sunset return to the village where you can take a dinner in mud huts or you can come back to the city to have a dinner. Later while you dine listen to the haunted tunes of the desert by the local artists and musicians, A lifetime experience. Overnight at Hotel in Jaisalmer. Ranakpur Early Morning drive to Jodhpur the blue city, Visit the majestic Mehrangarh fort, the stronghold of the Rathore princes from 1453AD. We see the superb collection of paintings and arms and ammunitions. The view of the city from the rampart walls is breath taking. Going down from the fort visit Jaswant Thada. In the evening visit the Umaid Bhawan Palace, the present residence of the king of Jodhpur. Retire to your hotel and relax. Post lunch session introduces you to the fabulous spice market of Jodhpur the 2nd largest city in Rajasthan. Walk along the market to feel the odors of the spices filling the air around you. Overnight at Hotel in Jodhpur. Jodhpur Morning drive to Ranakpur Temples - a very big pilgrimage centre for the Jains, admire the workmanship from the 15th century temples situated in the lovely valley of the Aravali Mountains. Its sorrounding is quiet & picturesque. Ranakpur has grand structures & beautiful sculpture. The temples are built out of marble and the main shrine of Adinath with 1444 columns is awe inspiring and none of these are similar. Also see the sun temple and the other temples in the campus. Overnight at Hotel in Ranakpur. Ranakpur After breakfast drive up to Romantic City of Lakes - Udaipur, On the way visit The Kumbhalgarh Fort - the stronghold of the kingdom of Mewar built by Maharana Kumbha in 1453. Visit the palace and see the beautiful mural paintings in the Zenana mahal (ladies quarters). The view from the parapet wall is breath taking and this is where the soldiers used to be stationed to view the advent of the enemies. The fort has 7 gates through which we need to enter to gain access to the palaces. See the temple where Maharana Kumbha was treacherously killed by his own kith and kin during his prayer to win the seat of Mewar. On the way stop by the fields to see the local way of farming and irrigation. Walk into the villages to mingle with the locals around to know more about their lifestyle. Reach Udaipur by late afternoon and check into your hotel. Overnight at Hotel in Udaipur. Udaipur Take a full day city tour consisting the City Palace - the richest palace museum in the entire Rajasthan. See the Peacock Square and the miniature painting school inside the palace premises. Udaipur has the prestige of housing the best miniature schools in the country under the royal patronage of the king of Udaipur. Later, see the Sahelion ki Bari where Maharana Sangram Singh build this garden complex with fountains and lakes for his beautiful daughter. In the evening we take a lake cruise on the placid waters of Lake Pichhola by sunset and visit the island palace Jagmandir where according to legends the Mughal Emperor Shah Jehan lived and got inspired to build the Taj mahal later. Overnight at Hotel in Udaipur. Ajmer Leave Udaipur and reach the temples of Nagda and Eklingji. The temple at Eklingji is a temple that belongs to the Maharana of Mewar (royal family Mewar) and he is often there to pray. The temple complex of Nagda is a group of temples of which only two remain intact and those are that of Saas and Bahu. Both the temples, of Shiva and of Vishnu, are from the 7th century. 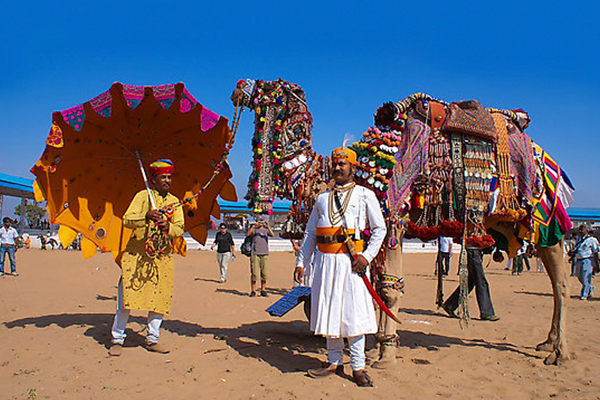 Pushkar happens to be the holiest places according to the Hindus as it is considered that Lord Brahma (the Creator) and his wife Saraswati (the goddess of learning and music) performed a ritual in the lake. Here we visit the only Brahma temple of the world before intermingling with the local colors in the local bazaar. 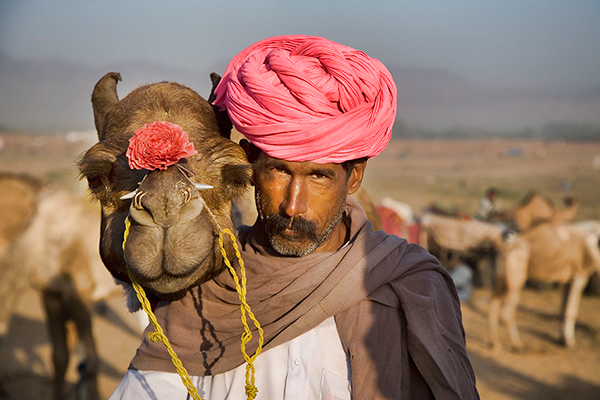 Pushkar is the world famous for its cattle pushkar fair held each year in the month of October/November. On the way visit you can visit Ajmer, Ajmer is the pious city for the Muslims. Surprisingly both the cities are at distance of 11km from each other. Visit the Durgah built in fond remembrance of Khwaja Moin ud Din Chisti where the Muslim pilgrims from all over India throng during the festival times. Later visit Mughal emperor Akbars Palace where his son Jahangir received Sir Thomas Roe to grant him the permission of trade to East India Company with India, that changed the history of India completely and slowly and steadily India became colony of the British Empire. Overnight at Hotel in Pushkar. Pushkar is one of the holiest cities of Hindus and is the only place in the world, with a temple dedicated only to Lord Brahma. 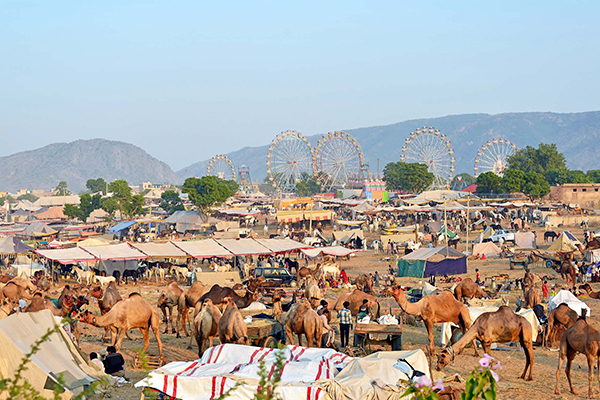 Take a holy dip in Pushkar Lake and visit the very famous Pushkar fair and all its activities such as camel ride, tug-of-war and witnessing the camel contests and cultural performances of the folk artists dressed in traditional attires. 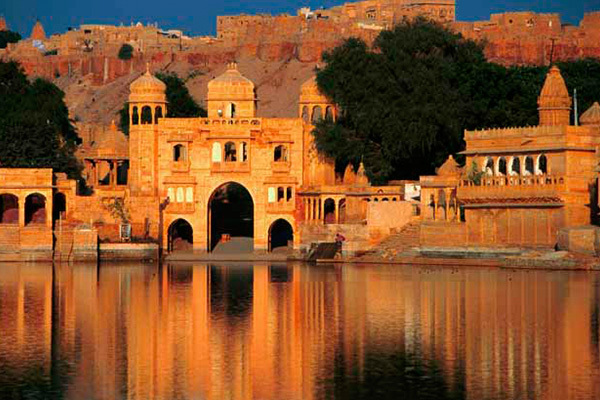 In the evening, ride the camel cart to the 52 Ghats of the lake. Overnight stay and dinner at the tented camps amidst the sand dunes and folk song, music and dance performances of Rajasthan. Overniht at Hotel in Pushkar. 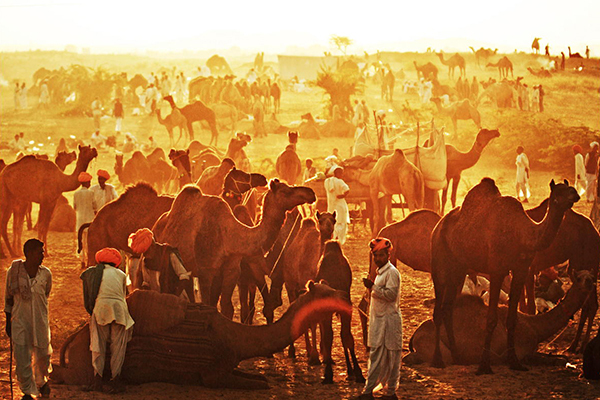 Pushkar Morning free to visit the great Pushkar Camel Fair, Later proceed to New Delhi, Upon Arrival in New Delhi, You can visit Sikh Temple or you can walk around the Connaught Place Markets or Janpath. Take a dinner in the restaurants at this center of the city. You will be transferred to the International Airport, 3 hours before your International Flight time for your further journey back to your country. Departure concludes with happy memories of your India Tour. Delhi: Jama Masjid, Rajghat, India Gate, President house, Qutub Minar, Lotus temple, Bangla Sahib Gurudwara, Birla Temple. 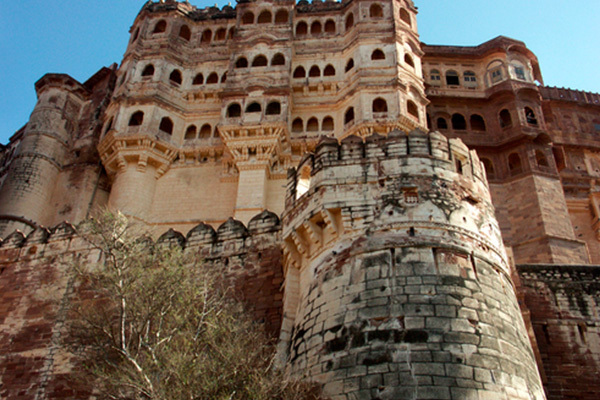 Jaipur: Amber fort, Jal Mahal, Wind Palace(Hawa Mahal), City Palace, Birla Temple, Gatore, Galta Ji(Monkey Temple), Cinema.